Hi Hat Garage. Photo by Joey Grihalva. In last week’s Now Serving, we reported on a few bashes happening in the remainder of the summer, including The Iron Horse Hotel’s End of Summer Birthday Bash on Sept. 17th and Milwaukee’s annual Cocktail Week from the 16th through the 22nd. If you missed out on those events, don’t fret because there’s plenty more where that came from. OnMilwaukee reports on two other events happening this week for fans of food and fun. On Sept. 26th, you can come the Comet Cafe 20th Anniversary Block Party from 11 a.m. to 8 p.m. The party, located at Comet Cafe on 1947 N. Farwell Ave. will include local vendors, Lakefront Brewery beer, and of course, food from the Comet Cafe. Chimp Eats Banana, Filtharmonic, Alta, Ahab’s Ghost, Boy With Bosoms, Twoers, and Floods Fires along with WMSE DJ’s will be providing tunes for the party. In the event you can’t make it, you can also check out Comet’s special anniversary brunch and dinner menus. The very next day on Sept. 27th, Hi Hat Lounge and The Garage along with Balzac and La Masa will host GarageToberFest from 1 to 10 p.m. at 1701 N. Arlington Pl. The Octoberfest event will feature German food, beer and wine and a limited brunch and dinner menu from the restaurants involved. Music will accompany the food and includes artists Chad Galaszewski, The Riverwest Aces, Brewhaus Boiz with Mike Schneider and The Carpetbaggers. Carnival games round out the festivities. The event is free for all ages, but those 21 and older who come in wearing lederhosen or a dirndl will receive a free bratwurst and a beer. About three weeks ago, I reported that Maharaja will be cancelling their popular weekday buffet in favor of a new weekend brunch buffet. But due to popular demand, the weekday buffet returned last week, according to OnMilwaukee. The buffet features over 20 authentic Indian dishes, including new and seasonal options. It is available Monday through Friday and is $9 per person and $4.50 per child. The weekend brunch buffet, featuring 40 dishes, is still available Saturday and Sunday is $18 per person and $8.50 per child, which includes beverages. Milwaukee can never get enough custard, burgers and beer. And now the three Milwaukee staples are moving into Grant Park. A new Ferch’s Malt Shoppe & Grille location opened on Sept. 12th in Grant Park Beach during the Beach Walk event. According to South Milwaukee Blog, the restaurant plans to open on select weekends in September and then “hit it hard in 2016 and beyond.” You can check out updates on the restaurant on Ferch’s Facebook page. Fresh Farm Bowls, a new business serving international dishes made with local ingredients straight from the farm, hit a roadblock. Owner Jonute Svien was just about to upgrade his pop-up tent business with a food truck when he ran into a problem: no food truck! OnMilwaukee reports that Svien was waiting on a company in West Virginia to fabricate the truck with equipment and deliver it to him. After the delivery was delayed, Svien asked the company to send him a picture of the finished truck. They instead sent Svien a picture of someone else’s truck. So Svien hired a private investigator to figure out things, and a few weeks later the truck was delivered to him, albeit in an unfinished state. In fact, the legs of the steam table were missing. But this hasn’t deterred Svien from his business. Three weeks later, he downsized the company and has since then contacted a consultant and ordered a shiny, new food trailer from a Tennessee company called Freedom Trailers. He lost a lot of money from the company in West Virginia, but he was able to buy the trailer with $15,000 in funds from five investors through Fund Milwaukee. Fresh Farm Bowls is serving at the Milwaukee County Courthouse on Tuesdays, Westown Market on Wednesdays, the U.S. Bank Building on Thursdays and Red Arrow Park on Fridays. You can check out their website, Facebook and Twitter page for updates and locations. Mikey’s is getting a new BBQ menu. According to OnMilwaukee, Mikey’s, a SURG restaurant located on 811 N. Jefferson St. known for its comfort food, unveiled a new BBQ menu last Friday. The new menu will also accompany a change in artwork and signage for the restaurant over the next few weeks. Executive chef Jason Altston, a ward of Chefs Justin Carlisle of Ardent and Israel Cruz of Umami Moto, perfected his smoking techniques over the summer for the new menu. You can sink your teeth into Texas-style brisket, chopped pork shoulder, spicy smoked sausages, smoked chicken and St. Louis-style spareribs. You can order a half-pound or pound of meat for $9-26, or have two, three or four meats together as a combo platter for $16-30. House-made sauces and sides of baked beans, mac & cheese, potato salad, southern fried corn, coleslaw, cornbread, and more will accompany the new dishes. Sandwiches, like The Carolina Pile ($12) which is a smorgasbord of smoke pulled pork shoulder, slaw and onion strings on a potato bun, will also join the lineup. And of course, popular Mikey’s dishes, like the chicken gnocchi ($13) and Mikey’s meatloaf ($12), will still be available for consumption. Independently owned craft brewery Black Husky Brewing LLC will be moving their base of operations from Marinette County to Riverwest by next spring. 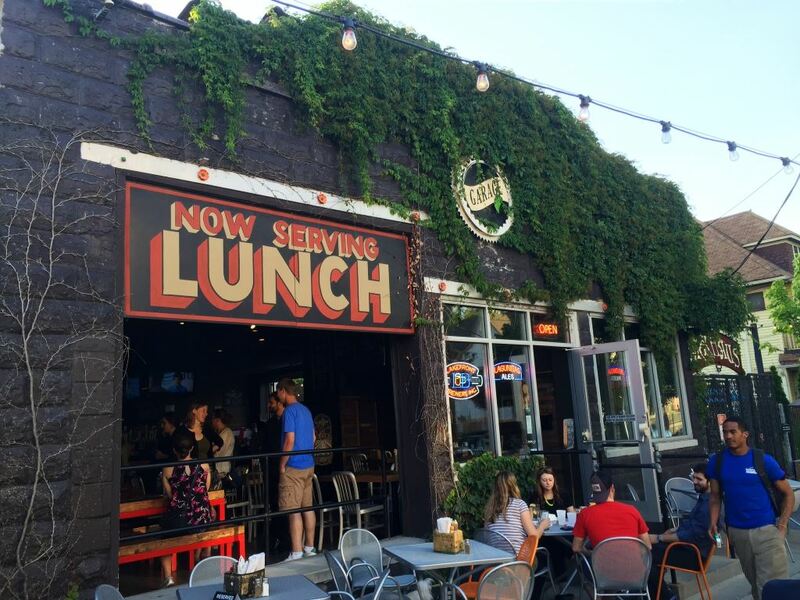 According to the Milwaukee Journal Sentinel, Owners Tim and Toni Eichinger made the move because their company is located in an area that’s 200 miles away from Milwaukee taverns and liquor stores. They will be buying a 7,000 square foot building at 909 E. Locust St. and will convert part of the inside and the parking lot outside into a tap room and beer garden respectively. They hope to expand from producing 300 barrels a year to 2,000. They also hope to hire people for full-time jobs that will pay a living wage. As I just reported in Urban Milwaukee, Outpost Natural Foods will be celebrating its 45th year anniversary by hosting a 45 mile long bike ride to each of its four locations in Bay View, Wauwatosa, Mequon, Capitol Dr. and back again. Food and drink, as well as a lunch at the Mequon location and birthday cake at the Bay View one, will be included with registration. The ride is on Sept. 26th and begins at 8 a.m. with check in starting at 7 a.m. Registration is $10 for individuals and $20 for families. Check out the event’s website for more information and to buy tickets. Big Daddy’s Brew and Que is now serving their brand new menu to go along with their renovation and change in focus. The restaurant invited media pundits all around the Milwaukee area, including myself, to partake in a sampling of the new dishes. Located right next to iPic Theaters in Bayshore Town Center, Big Daddy’s Brew and Que have been serving barbequed meats since Feb. 8th, 2013. But they decided that they wanted to be more than a barbeque place. iPic Theaters general manager Jeff Brown said that they wanted to reinvent themselves for a broader audience. So they renovated the place and developed a new menu with iPic Entertainment director of culinary standards Chuck Jaloski and executive chef Thomas Sorrells. And what a menu it is. 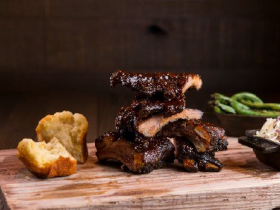 The menu flaunts a near-flawless blend of barbecued meats, sauces and other dishes. The Big Daddy’s rib tips and smoked baby back ribs were and obvious highlight. Chef Sorrells said that he disliked meats that just fell off the bone, so he cooks them in a way that you have to work at them to take a bite. Not to say that the meats are tough, far from it. It’s just the right balance of being solid without being too chewy or dry. It’s a feat of barbecue cooking, and it’s all accentuated with a light brush of BBQ sauce. For true meat lovers, you can sink your teeth into the pitmaster burger, and 8 oz. 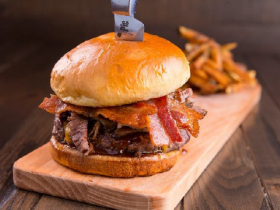 Angus beef burger piled high with pulled pork, beef brisket, Applewood-smoked bacon and cheddar cheese. It’s definitely not for the faint of heart; you may just get a heart attack. The patty is nice and moist despite being a bit crumbly. I didn’t get to taste much of the other fixings, but that may be because I only took a bite of the edge of the burger. 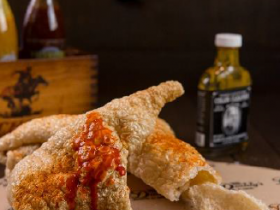 An interesting addition was the spicy pork rind, a fried bit of pork skin the size of a fairground elephant ear served with a chipotle mayonnaise dipping sauce. The rind takes a bit of muscle to break off. While definitely something you don’t see every day, the rind itself is bland and only used as a vehicle for the sauce. The honey-dipped cornbread was heaven on Earth. The bread was warm, light and fluffy while still providing a chewy texture. And it was sweet without being too much. It’s not too crumbly either; it still falls apart a bit but it’s not like it turns into sawdust with one touch. 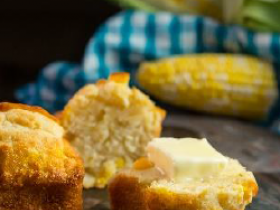 Truly an achievement in cornbread culinary arts, if such a thing exists. 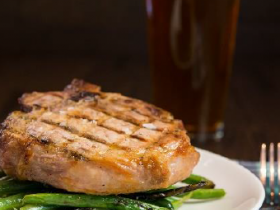 The big new addition to the menu is the plate dinners, and one such plate is the bone-in pork chop served with a side of crispy and chewy Brussels sprouts and tangy mustard. Interestingly, Chef Sorrells cooks the pork chop in rosemary tea. Unusual? Yes. Delicious? Yes! The pork chop was wonderfully moist and thick and goes wonderfully with the sides. The tons of meat can be overwhelming, but luckily there are a few lighter dishes to balance everything out. 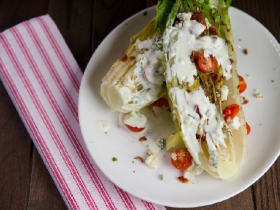 The wedge salad takes grilled romaine lettuce and fills it with blue cheese dressing, Applewood-smoked bacon and cherry tomatoes. Many different kinds of sides join the menu, such as the aforementioned Brussels sprouts, salty and sour braised collard greens and creamy blue cheese potato salad. All of the sides are good options, and you can get two of them along with cornbread with each purchase of the smoked meats. Ending things was Aunt Barb’s banana pudding, a wonderfully sweet and light conclusion to a meaty exodus that combines bananas, custard, Nilla wafers, and three different kinds of meringue. But there’s a secret ingredient: the extract of yuzu, a Japanese fruit. The extract gives the dish a bit of a tang, which contrasts nicely with the sweet meringue and bananas. Overall, I had a wonderful time at Big Daddy’s Brew and Que. It’s going to be tough to beat the variety and taste that you can find there. You can take a bite yourself by heading to 5800 N. Bayshore Dr. in Glendale from 11 a.m. to midnight (or till 2 a.m. on Fridays and Saturdays). Also be sure to check out The Que Fest from Sept. 22nd to 27th for live music, food and drink specials, and contests including a pig-calling contest.